Have you ever wondered how digital cameras detect faces? If you thought that computer vision was rocket science and too difficult, that notion is no longer true. There is this wonderful open source library called OpenCV that runs on Windows, Linux, Mac, iOS, Android and now RaspberryPi. Sophisticated visual algorithms are no longer limited to only high performance desktop computers. 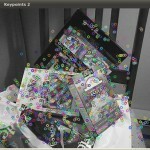 Using either your smartphone or a RaspberryPi, you can embed image detection in everyday life. To get started, download the software needed for your device. Here are some nice tutorials to get you up to speed on using it. Anyone using OpenCV? What are you doing with it?